A dazzling debut novel of love and loss, faith and atonement, on an untamed nineteenth-century Scottish island. Exquisitely written and profoundly moving, Island of Wings is a richly imagined novel about two people struggling to keep their love, and their family, alive in a place of extreme hardship and unearthly beauty. Everything lies ahead for Lizzie and Neil McKenzie when they arrive at the St. Kilda islands in July of 1830. Neil is to become the minister to the small community of islanders, and Lizzie-bright, beautiful, and devoted-is pregnant with their first child. As the two adjust to life at the edge of civilization, where the natives live in squalor and babies perish mysteriously, their marriage-and their sanity-are soon threatened. Karin Altenberg is senior advisor to the Swedish National Heritage Board and is a fellow of the Linnean Society. She is currently at work on her second novel. She lives in London. 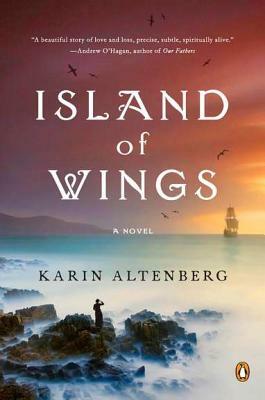 "Island of Wings captures a world that disappears in the act of description, and the love, so inescapable and elusive, of the outsiders who try to tame it.With scrupulous attention to place, history, and the natural world, Island of Wings tells a story washed by a clean and lovely kind of sorrow."